Rated 5 out of 5 by margann1952 from THE BEST IN THE SERIES! I have been playing for less than an hour and I am very happy with the fifth game of this series. I already have the other four games and they are very good. The quality of the graphics, sound and special effects are all excellent. The HOS segments varied and enjoyable. I love the mini games. The storyline is interesting. You, as an agent of the CCPP, must stop the Watchers of another dimensional world from taking control before they eventually invade Earth. A visitor, named Kraixx, came from another world through a portal seeking yours and Professor Bennett's help. The three of you go through the portal, but become separated. You then have to make your way through collectibles, HOS and minigames to be able to meet the Professor and Kraixx in the city. There is a map to make the travel from each scene easier. There are owl collectibles along the way to collect, so keep an eye out for them. 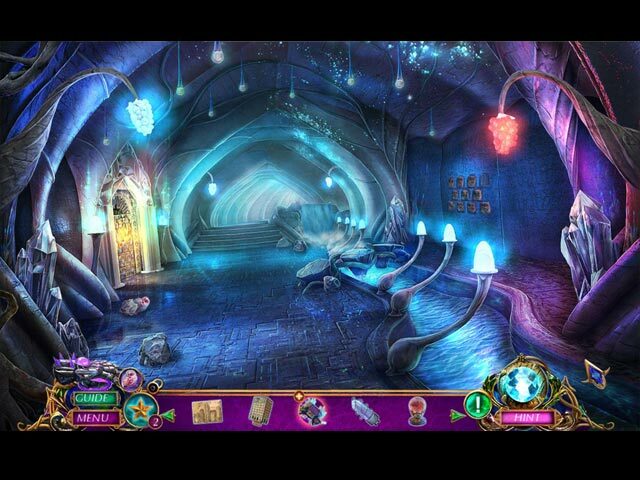 This is a game for the regular players of Hidden Object games. It will take you through beautiful scenery and also their are interesting facts to learn along the way about Kraixx's world. An all-round enjoyable game and I recommend this game. Rated 4 out of 5 by Torpedo1 from Orbs, Crystals, and Owls OH My! Story line was excellent, but the pink hues because of the title of the story was not my favorite to look at. HO's were symbol finds. Plenty to do and a jump map. Collect crystal Owl's, Character were okay. Cut scenes were just okay. Not one of Epix best nor most exciting games. I will buy it hoping the game play gets better but on the fence between like and not liking it. Rated 3 out of 5 by dancemom1 from Disappointing to say the least... Hello friends! Another addition to the Amaranthine series. This makes #5...the only one I didn't care for was a CE or an SE was Tree of Life. The graphics in this one are quite good, with very clear, nice colors. There isn't a lot of animation. No music to speak of, but some nice sound FX. Game play was very good, no problems during the demo and it fit my large screen very well. Voice overs aren't bad, but not a lot of dialog either. This is a pretty quiet game. It could have used some excitement in the voices or at least a build up of music to make it more exciting. You do time/dimension travel, so beware of the bright lights now and then. HOPs are pretty straight forward, lists, silhouettes and the like and are fairly clean. Items are not difficult to find. If you want a change of pace, you can switch to the "bubble popper" game - not my favorite. Hint system is helpful, but occasionally just states "I suppose I better move along." I much prefer having an actual hint. It does transport, which is a big help since you back track frequently. I didn't even look at the SG, as I only use them to make sure I'm finding the collectibles. Puzzles were frequent and some take a bit of time and thought to complete. There is a little challenge here. Collectibles: all I found are "pink" owls. Yep, I said pink! The are large enough to see easily, but some look more like a blob of silly putty laying on the ground. There is no challenge here at all. Unless I missed something, that's all there is. Very disappointing. I beta tested this one back in June and did not feel it was CE worthy then and still don't now. That was before I even knew what the collectibles were. The game flows fairly well and is easy to follow, but wasn't one of those games that made me want to buy it to see what happened next. It was lacking in that "gotcha" factor that makes you want to keep playing. Maybe it was because the demo was so extremely short and you just didn't have time to really get into it. Anyway, I will put this one in my maybe puddle and give it another shot when the SE comes out, or a really, really good sale. I think beginners will find this one a good game, so I will recommend it for them, but not for a seasoned gamer. As always, try it for yourself and see what you think. We all have different tastes in games and you may find this one to be exactly what you are looking for. Thanks for the reviews. Rated 3 out of 5 by cabanaeast18 from Nice, but no thanks The graphics were good, but I am not a fan of computer-made characters. The tend to look fake and one dimensional. The story was good but I couldn't get into it. I want to have time in the game to enjoy the story (along with the tasks etc). Rated 3 out of 5 by nariiska from Orb of confusion I was excited to play another chapter in the series until I played the demo version. nothing made sense there were too many layers for every turn, mini game and storyline being revealed. it is unfortunate for a strong series to have a weak chapter. I will not play this chapter. Rated 3 out of 5 by gobaba from Um, Where Is The Eipix I Know & Love? Based on the main & bonus games Actual rating 3.4 Straight up, this series is not my fave. Crystals, artifacts, glowing gauntlets, unicorns, fairies, what have you, leave me reaching for Maalox. But I love Eipix so I gave it a try. Oooo. It's basically a save-the-world-before-dinner story. The puzzles are, well, too easy. The exception was one multi-step puzzle that I really liked. The HOs are rather dull laundry lists and have no morphs like usual. Challenge level is low. Collect 43 pink owls that are easy to spot. Graphics are, well, odd. Some characters are painstakingly drawn and others are muddy watercolor. Background graphics are mostly well done. Bubble-popper games are an alternative to HOs. I'm a disaster at those--the little balls roll all the way around and laugh at my feeble attempts to control them. Okay, 43 scenes in all, including main & bonus games. The bonus game is about 30 minutes, and does extend the story somewhat. CE bling is very good, replayable HOs & puzzles, you can go back and find any owls you missed, and the souvenir room is a mini-collectable game. Plus the usual. Is it worth a CE? Um, no. I don't think I'd do that. You might want to skip the SE too, and hold out for a better Eipix game. I know they're capable of it. Just disappointed in this. Rated 3 out of 5 by SkyeGray from Not a good value; As soon as I see purple fog in an Eipix game, I know what I'm in for. They seem to have come up with a formula for their premium games. Bad stories, bad magic (always evidenced by purple fog) and really short games that can be completed in several hours. On the plus side, I favor games with pretty HOPs (no disgusting corpses, roaches, worms or centipedes in the mix) and Eipix does have some pretty pictures. It also has the custom difficulty setting, which I value as I can't stand waiting to skip a game or get a hint. I know when I want these things and resent having to wait for them. I just wish Eipix wouldn't be satisfied with pretty, mediocre games. I miss the days of Myst! And Blue Tea's Dark Parables! I can recommend the game, because you already know what you're getting - it's like eating at McDonalds - just another McEipix. Rated 3 out of 5 by Daxadillion from I Would Have Preferred Not To Have Had A Helper! Before anyone says there wasn’t a Helper there was for me - my 7/10 grandchild. BASED ON THE DEMO I have all of the Amaranthine games and enjoyed the first 3 but they have definitely gone downhill with the last two. The storyline just didn’t grab me as it was all over the place. The lip synch was poor which surprised me as these devs usually do it very well, and what’s with the professor’s smug expression when she proclaims that the core is about to explode? Music - sorry to say that I didn’t hear it due to 7’s chatter. Gauntlet - even 7 hated it and made me use it. Mini Games/Puzzles - way too easy-peasy until I got to one where you had to position the orbs in a line that crosses the stars, which I found difficult due to the onset of arthritis I was struggling to line them up properly, 7 wasn’t! HOPS - I liked them until I came across one that pans from side to side as they make me dizzy. There’s also a scene in the game that pans left and right, for me that’s a no no. I slogged through the rest of the demo knowing I wouldn’t buy it and when the demo ended sadly the ‘call of nature’ had me heading for the bathroom leaving 7 with his hand on my mouse. I nearly cried when he shouted that the game was FREE but only because BFG automatically inserts your game club credits onto the BUY page and 7 had bought it after seeing the cost of £0.00! My only consolation is that I can find the owls he missed all on my own, replay the HOPS and Mini Games/Puzzles without help, find everything in the Souvenir Room and play the Bonus Game alone, and yes the cost was a “large pill” to swallow as I had been waiting for a really good CE. My rating of this game would be 1 star only, 7’s rating was 5 stars so we eventually agreed on 3 stars. Rated 3 out of 5 by shihtzumum from Actually, I'd give a 2.5 if I could WOW, glad that demo is over as I was bored out of my mind. I've like and purchased others in this series, but this one is just way too strange for me and quite uninteresting. There was a puzzle every time I turned around, some easy and some very hard, but way too many. The HOs were OK, but the one you had to find the symbols was extremely hard for me and even if I used the hint, some of them still didn't look like what the clue gave. This is a total pass for me and wish I hadn't even loaded it. Go for it if you are into some real wayout Syfy adventures, but I want to have a logical understanding of the world I'm playing in. Rated 3 out of 5 by mrm2006 from It's time for the Voyage to end. Based on the Beta and CE Demos. Light Harmonium = constructive energy. Dark Harmonium = chaos, destructive energy. Entire worlds have been destroyed when the balance shifts. Your character is Eve Glover, sent for to help cure an Alien. Easy, Medium, Hard and Custom difficulties. Graphics were ok. Nothing really impressive to me. Music seemed inappropriate to the surroundings. Voice Overs ---- Of the characters I met, the woman needed the most work. The tonal inflections were well done, however, the woman's facial features were very dead-pan. Also, voice overs were 'off' and not in sync with lip movement. You received a map which I found repetitive in its use. Click on the area you want to transport to ...... and that area became a circular area in the upper left corner of the map ..... where you had to click on it AGAIN to transport. Repetitive. The hint button also transported you so I relied on that. You also received a 'gauntlet' which can absorb dark energy. Play a mini-game to gather it. But, then, it dispelled other energy? Too confusing for me. Just wait for the gauntlet to light up and do its thing. HOGs were silhouette and interactive silhouette. Yes, there is a difference. Mini Games were fun, innovative and new. Some of the instructions were difficult to understand while others weren't difficult, just time-consuming to finish. Besides the usual CE Bling such as replayable games, wallpapers, music, etc., there are 43 owls to find. A souvenir room that wouldn't unlock until after the Bonus Game was played so can't comment on that. Great for any level of expertise and more enjoyable for those who are way more high-tech than me. Definitely a standalone game (you do not need to have played previous games in the series to understand this one). Is it CE-worthy? IMO, no. There's just not enough of the 'extras' in the extras. Amaranthine's Voyage has come to an end for this gamer. In this new game in the series, everything was a bit too high-tech for me. Both in game play and the scenery. Unfortunately, this will NOT be a purchase for me. ENJOY! Rated 3 out of 5 by LogieBaby from If Harmonium is the objective, why is this game so disjointed? I was pleased to see another Amaranthine episode is in the offing. Unfortunately, the game started. The story is rather preposterous even for a combination sci-fi + fantasy theme. Professor Samantha Bennett needs help with her harmonium project so she calls in Eve Glover ( that's us ) who is the acknowledged expert re harmonium. Upon arrival at Bennett's lab Eve encounters Kraixx, a Watcher from another world called Medea. It seems Kraixx's planet is facing destruction since black harmonium has somehow overtaken it. Kraixx via a portal has arrived on Earth and summoned Bennett for help. Bennett though a leading experimenter is as useful as a screen door on a submarine so Glover must do all the work. This part of the story really bothered me. If Bennett is so extraneous to the goings on, why even introduce her? I also found that Kraixx being totally humanoid and speaking perfect English a bit perplexing. Glover must initially cure the alien of some illness by conducting tests to find the medicine. Should not Bennett have already done so? I realize full well that in all HOPAs certain tasks must be performed by the main protagonist. For some reason it bothered me ( in this game ) that so many things needed to be solved just to find a cure. Why must cabinets always be locked or need to be opened by procuring the correctly shaped objects? This is supposed to be a well organized lab yet in reality it's a jumbled mess. Developers really need to stop doing this in every game. Gets boring when we get the same old same old time after time. At any rate the alien is finally fixed and he and Glover are teleported to his realm. Here the game does improve somewhat. The objective is finding a balance between light and dark harmonium to save Medea. The bad guys are the Watchers who arrest Kraixx as a traitor at the end of the demo. The only part of gameplay I found interesting were the puzzles, some of which were quite inventive. There are no traditional word list HO segments in the demo. There are owls called Freyy's apprentice to be collected, Freyy being some hotshot scientist on Medea. For me Orb of Purity doesn't come close to the entertainment value of prior Amaranthines. The series has stand alone games and unfortunately his one fails on too many levels to warrant consideration of purchase. Rated 2 out of 5 by Firehorse66 from Way to many boring junk pile hops! I have no idea what made me buy the CE version, I must of been desperate for a CE game. There were way to many junk pile type hops, very boring, no interactivity, this ruined the game for me. Puzzles, nothing special. I hated the fact every time I get to a new scene or complete something this side bar pops out twice and you can't do anything until they are both done, this continues throughout the entire game, ugh. There is a glove you have to continually wait for it to charge up then you can click on it and play the same lame puzzle over and over again. This is ok for a free game voucher for the SE version, but even then it was a chore to finish. Rated 2 out of 5 by 1PirateWench from Mini games WAY too easy! I am not that great at mini games, so I was very surprised and disappointed how easy all the games were. There was absolutely NO challenge. It was a visually beautiful game, but I felt it was a total waste of money. Rated 2 out of 5 by becuille from Not great This is one of the few HO games I've really not enjoyed. I bought the CE and didn't even play the bonus game because I was just so relieved to be done with the main story. The storyline is... well, I'm not entirely sure what it is because I stopped trying to figure it out after a while. There's something called Harmonium and it can mess worlds up. It's gone awry and messing up a world you have to go into with a big silver glove to fight it. The classic HO scenes are few and far between. Usually, everything turns purple and your glove pops out. This is your cue to click on your glove then find pairs of symbols or rearrange ropes in order to negate the harmonium before you can continue. This happens a lot, seemingly at least once in each location. It takes a while to even be able to click on the glove as everything goes inactive till you've sat and stared at all the purple lights for a while. In fact, everything goes inactive quite frequently. Even if you want to skip a cutscene, you still have to wait a while and everything is still inactive for a while once it's over. It got very frustrating. Because of constantly having to negate the harmonium, there's no real chance to just enjoy your surroundings. I favour HO games in beautiful fantasy locations, which is why I picked this one, but I didn't get a chance to enjoy that part of it because it felt like every time I tried to soak up the atmosphere, here come the purple squiggles again. Overall I found this confusing and unfocused. I think they tried to throw everything but the kitchen sink into this one and it could have really done with some streamlining. Rated 2 out of 5 by sfr8rfan from I Feel Like a One-Armed Wonder Woman This review is based on completing the generous hour long trial given by BFG on a MacBook Pro using Operating System 10.9.5. "Balance leads to prosperity at the cost of freedom." This is the opening line of the game, spoken by an unseen narrator. I don't understand it. It's incomprehensible to me. It is not the thing in this game that's incomprehensible. As soon as I saw a gauntlet I knew there was trouble to be had. Issue #1 Lip-Synching: First of all, the lip synching is poorly done. But beyond that annoying little fact is the inconsistency of applying lip-synching. The first two scenes are lip-synched. The third scene is not. The fourth scene returns to lip synching. This confusing "feature" happens repeatedly, and without reason. Why is that? I'm not trying to pick nits. I just can't attribute this to anything other than poor editing and proofing. Does ANYONE look at the final product before it's released? This is NOT a technical problem. It's not a problem with my computer or the programming of the game. It's a problem with the quality of the game and that's what these reviews are about. Issue #2: I consider the soundtrack to be an essential part of a game and I have commented on this very topic often. This game was a cacophonous mix of background music and special effects. For a game which instructs it's best to play with sound, you'd think sound would be treated as a priority. Issue #3: I like the concept of interactive silhouette HOS...the ones where you find one object, depicted in the silhouette, and then use it on some item in the scene in order to find a second object. This requires a degree of logical progression...a degree NOT found in Orb. I've heard of "Fragmented Hidden Object Games" or "FROGS." 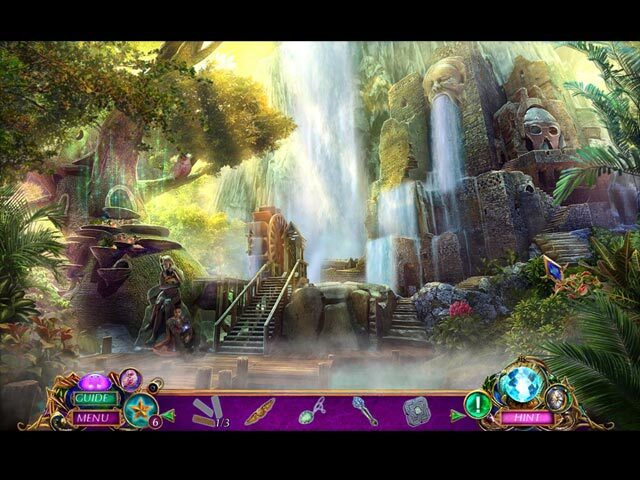 I'd characterize these as Fractured Hidden Object Games. Issue #4: Not every mini-game in a HOG/Puzzle/Adventure game needs to be 10-attempt stumper, but some should be. (I may be exposing my own limits here...for some of you perhaps it's a 5-attempt stumper, but a genius I am not.) These are some of the games I played: a. A 3-part puzzle, or three consecutive puzzles (i believe they are supposed to be in ascending order of difficulty) where you use shapes similar to those in tetris and place them in an outline. In other games, this can be very complicated: a variety of geometric shapes having to fit perfectly in a space which could contain almost any of them. In this game they were dead give-aways. So, of course, once again I called my trusty sidekick, Stanley, to do the puzzle for me. b. Next is a game which required putting alien blood molecules in spaces which perfectly match the models of their chemical structure. We've all played variants of this game which offer a real challenge...games where we have to purposely UNDO a section of a puzzle we worked so hard to finish because, oops,that one section has an item that belongs in the other section. Stanley needed a couple minutes to complete this one but it was simple. c. There's a Runes game, of course...what would a game be these days without one: Here we are challenged to match pairs of slowly moving symbols until they all disappear. I had to do this for Stanley because his paws kept touching a couple symbols at one time. Note: there were about 7 pair. Really? This isn't a beginner puzzle. It's a remedial puzzle. d. Another game required swapping two buildings at a time until 5 buildings were in the same order as on the map you're using as a guide. Stanley was napping by this time. f. Stanley missed the 3-part serial puzzle that was an effort to be like the great one's we see in MT or MCF. They usually provide a great challenge because of their complexity. The idea of "serial" puzzles which are not finished until each of three or four difficult rounds are complete is the zenith of puzzling to me. The three rounds in Orb were silly easy. Issue #5: The actors who portray the sometimes lip-synching, sometimes not, characters portray zero appropriate emotions. Apparently, life on our planet as we know it hangs in the "balance" of a subatomic Harmonium Complex Deus ex Machina or something or other....You'd never know it by listening to the bored actors reading their lines with all the urgency of molasses in January. This game fails on so many levels!! I don't recommend it for anyone. I'm now looking at the stars I awarded and realize I've been way too generous. Don't make the same mistake I did: of course, get the one-hour trial. Don't feel like you have to use it all. That sense you're getting at about the 15 minute mark...trust it. This is that bad. Try to ENJOY! Rated 2 out of 5 by crusades from unbelievable story and dull The first game in this series was great - maybe because it was the first but since then the stories are totally unengaging. Harmonium - who cares? Eipix churn out far too many mediocre games these days. The alien looked totally normal and why would he give his gauntlet away? Too many cutscenes with slow explanations, very simple games etc etc. Not a buy for me and did not finish the demo. Rated 2 out of 5 by Granny_Gruff from Ho......Hum..... You are Eve Glover, already in a car on your way to CCPP, when you receive a message from Professor Samantha Bennett requesting your help for an inhabitant from another world who had arrived by portal. As soon as you see the Professor, you are given a blood sample and told to cure the new arrival of his mystery disease. Even though we have no idea why he is sick and you do not stop to talk to him, you are now the resident expert on his illness and harmonium. (I think this was the first point at which I wanted to bail, but I hung in there.) There is some running back and forth as the only pair of gloves to run the blood sample through the testing equipment is retrieved from a locked cabinet in another room, among other time wasters/puzzles as you find the medicine that will cure the alien. The magic medicine instantly cures him and he introduces himself as Kraixx. Too bad none of the scientists in the facility could bother to run that blood they drew. Aren't you lucky that they waited for your arrival. Good stuff: No opening vehicle crash. HOPs with a marble-popper alternative, mini-games, and various puzzles to open locks on everything. There are little owl shaped pieces to collect in the scenes and some CE bling. There is artwork. Game-play is like a great many other games with the addition of a gauntlet to harness the black or white harmonium energy by completing a matching puzzle. Bad stuff: The VOs were OK sound wise but did not sync with the characters' lips. Both female characters in the opening have a strange stance, an off tilt to their bodies with oddly placed arms. Facial expressions do not impart the emotions of their voices, or perhaps the voices and dialogue are too serious for the faces. The developers were much more successful with the male character. There is no diary and the map is a two stepper - click on a location to open a window, click on the window to go there. And once again you will need to save the world, in a story that leaves me wondering why you want to do so. Once I saw the other world, I did bail. I am confused by anyone who says they don't like a game and then recommends it. I cannot endorse a game I will not be purchasing. I do recommend you try the demo for yourself. Rated 2 out of 5 by chezmah from Voyage downhill - bottom of the hill The first game in this series was great.... and the following "episodes" went downhill. I was nevertheless excited when i saw this game come out... as i hoped that i would find the same enjoyment that i did in the first game ! It did not take long for me to be totally disappointed....Its just not there. Stiff characters and a story line that is rather absurd. It just seems canned. Eipix is really not evolving, on the contrary, its back sliding into boring repetition. Although the artwork is very imaginative and of superior quality, just about everything else in the game is below average. To much blah blah, never ending cut scenes of sketches repeating the story ... ever so slowly....Useless filler that distracts you from the game play ...you keep getting cut off and have to wait to get back to playing. Its just not exciting, you don't get drawn in, you don't feel IN the game. The puzzles were for the most part stupid they involve NO brain work whatsoever and they too are so repetitive... line up the strings with the stars, pick pairs of symbols... i did them because i had to... and not once but over and over. Its like the devs were filling time with the same thing so as not to come up with new ideas. The map(though good art work) was confusing, too crunched together and there again, one has to click.... then click again. The HOs were ok but not much more than OK ... again the artwork was excellent, but finding the objects was in no way challenging ... no brain work. The art is the only positive thing i can say about this game. Some reviewers suggest that the series should be put to rest, I say, Eipix should attempt to not only bring it back to the level of the first in the series but, better yet ,.... improve it. There have been some EXCELLENT games produced in recent years, why don't the developers try to reach higher standards ??? I only played the demo and will certainly not buy this game.... its too bad, i really want a good game to play. 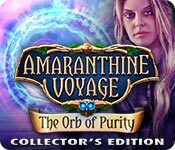 A game that takes me on a voyage of adventure and challenge... Amaranthine Voyage: The Orb of Purity is certainly not that. Rated 2 out of 5 by grapeleaves from Boring no excitment at all.!!!! Such a disappointment. I was expecting so much more from Epic. Hope a better game comes from somebody soon. This makes two losers so far. Rated 2 out of 5 by greenshade from The minority report Love it or hate it.. I hated the beta not much changed since then and uninstalled the demo after the first few minutes when I received yet ANOTHER gauntlet !!!!! If I never see another gauntlet to have to use in some gimmicky way it will be too soon. The alien looks and talks like a movie star.... a lot of mundane puzzles and tasks to complete even though it's so "urgent" that we be there and get things done. And HARMONIUM AGAIN???????? 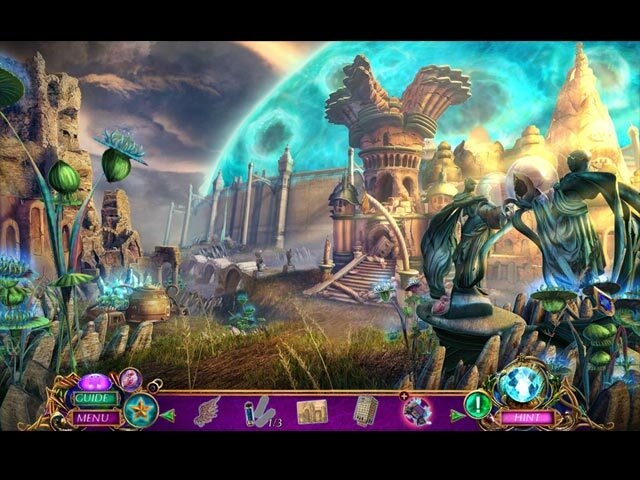 I adored the first Amaranthine Voyage and every game thereafter has become less and less challenging and interesting. I've come to believe that this is a series that should be retired. Rated 1 out of 5 by sjoycesam_1997 from Do not recommend This game is too confusing. Nothing like the other games in this series. I have all but two. Do not recommend this game at all. Rated 1 out of 5 by scamp69 from This is the worst game in the series. I have purchased several other Amaranthine games, the first being the best. I played entire Demo in Casual. The storyline was uninteresting. This had to be explained with many scene descriptions - too wordy for me. The characters were cartoonish and did not fit the scenes. Beatrice has a smirk on her face? The graphics are either crisp or fuzzy. Not very many HOs in the demo. Puzzles were about the only interesting thing. MAP makes you click twice: once where you want to go, then again in the picture of the scene. Duplicity is not only not interesting but annoying. All in all, not worth the price. Give it a try, if you like puzzles you might go for it. Rated 1 out of 5 by mrs_didi from Disappointing The first game in this series was great, second was good but this is awful. Why almost every game starts in car? Why?? Female character is ugly, like you cut head from one and put on some top model body.. No buy for me.. Rated 1 out of 5 by jocasta1 from Dull and Disappointing I have bought all the earlier CE games in this series, and liked them a lot, but this one is a swing and a miss! It is very dull to play, boring story, dull voices overs, tedious music etc. The puzzles are very easy as well, so no excitement there either! It really feels and plays like someone took a bunch of odds and ends from other games and dumped them into this, I couldn't have cared less about the heroine, the alien, or the darned harmoniium, so please play before buying in case you feel the same.